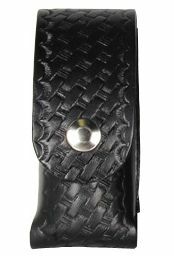 These units are built to last made of heavy duty cowhide with belt loops for up to 2.25 inch duty belts. All chemical holders are made with top grain, vegetable tanned cowhide of the appropriate weight for this application. Cut edges are filled and stained. Flesh areas are stained to match the outer finish. All sewing is lock stitched with heavy duty nylon thread and snaps are solid brass. All units, unless noted, are stocked with feed through belt loops or stainless steel clips if so noted. Models on this page fit all 1.5 ounce or less pepper sprays from Fox Labs, Police Magnum, 50 gram Foam from Fox Labs, MKIII(MK3) and from Defense Technology and 1.59 oz. Mace Gel 80269. 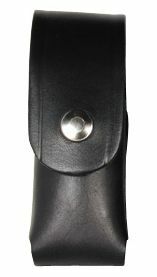 The spring clip version has a stainless steel clip (+2.00) instead of belt loop. The Gold model is plain black leather with a gold (brass) snap.